South Africa has launched its biggest apparel and textile trade fair, which is set to debut 9 April next year at the Cape Town International Convention Centre in Cape Town, South Africa. The purpose of the event is to create a fair for African-based manufacturers exclusively, to stimulate business between African companies and countries, to introduce participating exhibitors to South African retail chains and to export African products to the US. 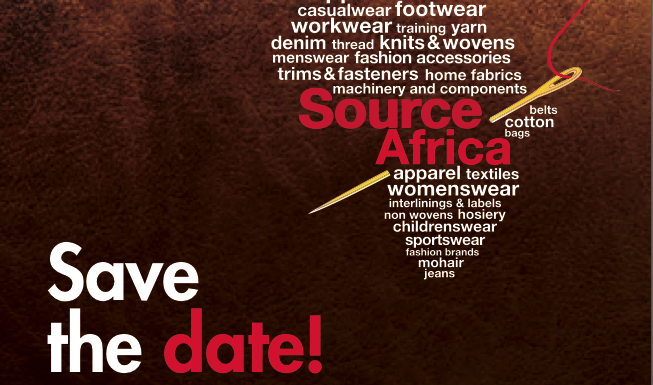 Source Africa will consist of a trade exhibition lasting two days, featuring stands from various African countries. The event will also offer a matchmaking programme to introduce buyers to vendors, factory visits for international buyers and a roster of seminars. Speaking at the event's launch, speaker Johann Baard, executive director of Apparel Manufacturers South Africa (AMSA) said: "It's clear that Africa's time has arrived. For South Africa's clothing industry, after nearly 20 years of decline, there have been encouraging signs of stabilization following policy interventions by the DTI. The declines haven't yet been reserved, but there is a lot of potential to create jobs and grow again." The launch's keynote speaker, Cynthia Brown, Public Diplomacy Officer at the US Consulate General in Cape Town, was upbeat about expectations for the African market. "Africa, as our business community is learning, now offers the highest rate of return on foreign investment of any developing region in the world. In fact, it's the only developing region where the growth rate is expected to rise this year," she said.